Skills: Read complex text and answer text-dependent questions in order to identify the main idea and key details, Compare and Contrast information in the text, Classify/Sort different devices based on different time periods, Create a communication device and write about it. Materials Needed: Pencils & crayons/colored pencils/markers, document camera or whiteboard, construction paper/scrap paper, recycled items like clean boxes, containers, cups, etc., beads, string, pipe cleaners, or any craft item that’s available, and scissors and glue. 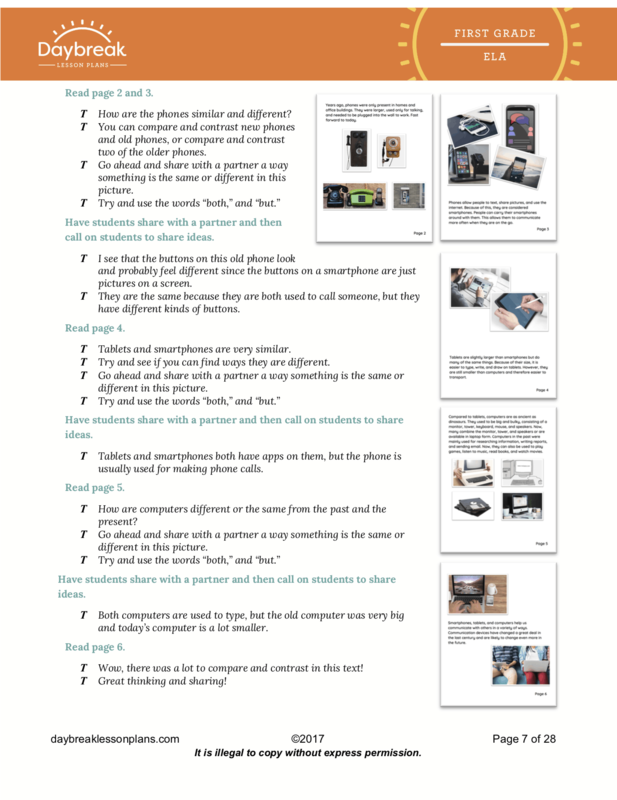 Printable Resources: Required Teacher Printable Resources: “Smartphones, Tablets, and Computers: Communication Devices” text (1 copy for display), “Communication Web” (1 copy for display), Venn Diagram “Phone & Smartphone” (1 copy for display). 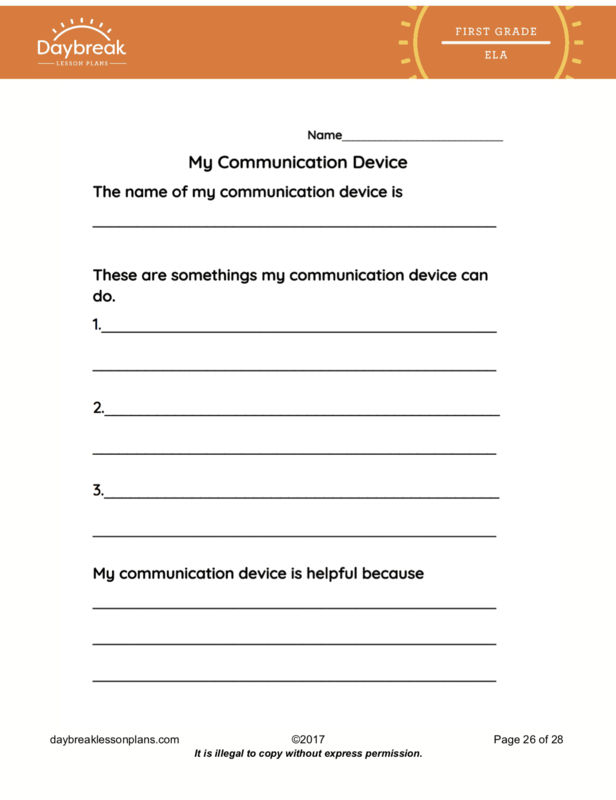 Required Student Printable Resources: “Communication Devices Then and Now Sort” (1 copy per student), Venn-diagrams “Computer & Tablet” and “Tablet & Smartphone“(1 copy per student), “My Communication Device” (1 copy per student). 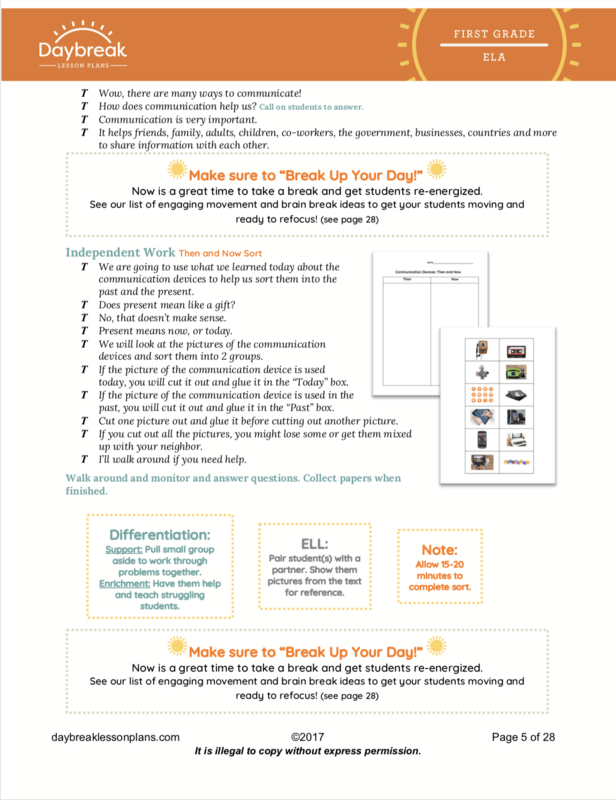 Optional Printable Teacher Resources: “Break Up Your Day” brain/movement break ideas. In this half day (3 segments related to NGSS PS.4) Informational Text ELA lesson, 1st graders will read complex text and answer text-dependent questions in order to identify the main idea and key details, compare and contrast information in the text, classify/sort different devices based on different time periods and have the opportunity to create their own communication device. 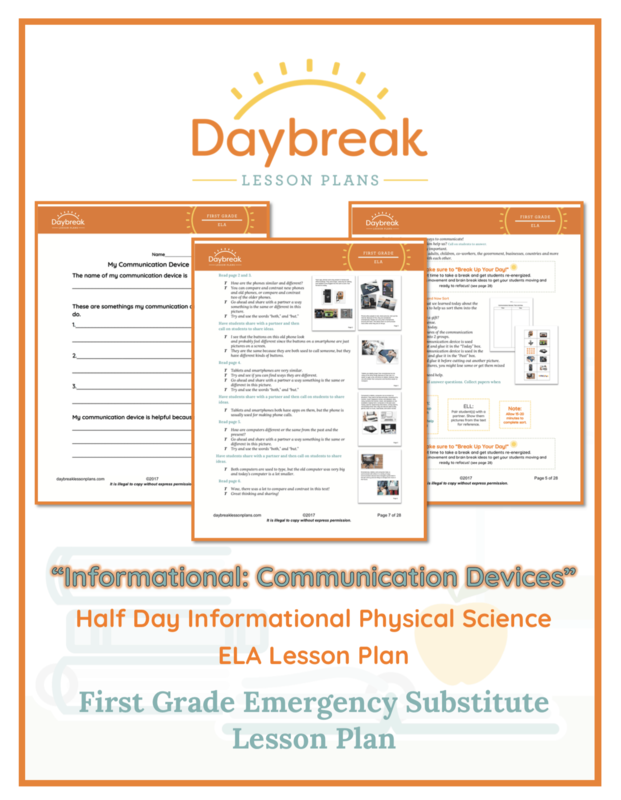 In segment 1, students will determine main topic and key details, discover ways to compare the different communication devices, and classify them according to time periods. In segment 2, the students will analyze the text structure (compare/contrast) and collaboratively create a Venn diagram. Segment 3 offers to students the opportunity to create their own 2D or 3D communication device using paper, write down the facts about the newly created device and share this information with the class. Exit tickets (the work created by the students during each segment) provide you with important feedback to determine instructional next steps.